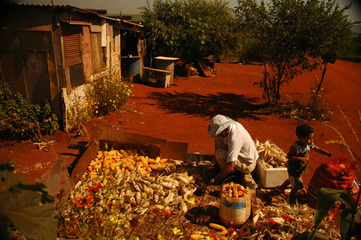 As a result of decades of farmers’ struggle in Brazil for access to land and food sovereignty, a National Policy for Agroecology and Organic Production was adopted in 2012, explicitly recognising the role of peasants’ own ‘creole’ seeds. In addition, since 2003, a national Program for Food Acquisition has given Brazilian farmers an important avenue for developing their own seed systems. Although it is not legal to sell seeds in Brazil unless they are certified, through this program the government buys creole seeds directly from farmers and then provides them to other farmers at no cost, thereby foregoing the market. As a result, some of the country’s largest peasant organisations have been able to develop their own seed systems. In addition to promoting families’ selection and use of peasant seeds, and developing community seed houses, these organisations have also developed large-scale programmes that provide seeds to hundreds of thousands of families. In addition to the 7,000 tonnes of maize, beans and forage crop seeds produced by over 2,000 small-scale farmer members of one movement in 2013, 800 tonnes of black bean seeds were produced and sent to farmers in Venezuela. Although this has been a major advance for securing the creole seeds needed by small-scale farmers, defending these pro-peasant regulations is a constant struggle. The US government has complained, for instance, that the food acquisition program went against WTO rules because it provides a subsidy to Brazilian farmers. Another major struggle for Brazilian farmers is against GMOs and the toxic chemicals associated with them. Brazil is the second largest producer of GMOs in the world, with over 40.3 million hectares under production in 2013. In October 2013, 5000 Brazilian farmers occupied a seed production facility belonging to Monsanto in the north-eastern state of Pernambuco. They replaced the varieties of GM-maize being grown there with creole seeds. As a result, some of the farmers have been persecuted and are now banned from Monsanto’s premises throughout Brazil. Brazilian farmers are also fighting against a current law under consideration among Brazilian lawmakers that would lift the country’s moratorium on a particular type of GMO known as ‘Terminator’. Why? Explain briefly. 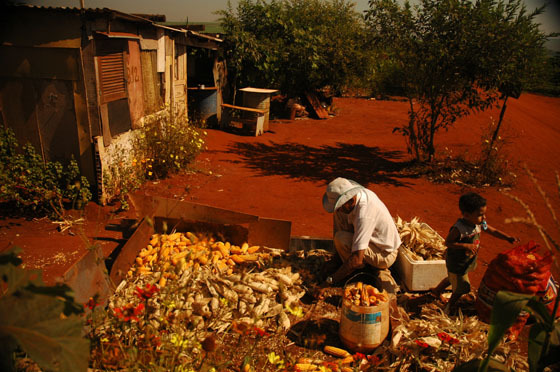 As a result of decades of farmers’ struggle in Brazil for access to land and food sovereignty, a National Policy for Agroecology and Organic Production was adopted in 2012, explicitly recognising the role of peasants’ own ‘creole’ seeds. As a result, some of the country’s largest peasant organisations have been able to develop their own seed systems.